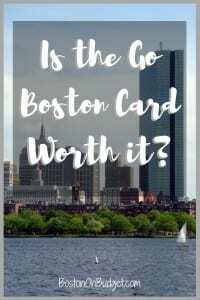 Is the Go Boston Card Worth it? I originally wrote this post back in 2014 but I thought it needed an update since prices and attractions change. The Go Boston Card can be a great card for tourists visiting Boston who want to see a lot with limited time. However, I often get asked “Is the Go Boston Card worth it?” and I always give a lame answer of “it depends”. This post breaks down the card with the attractions, prices, and possible alternatives to save at attractions to help clarify my lame “it depends” answer. Please note that this post does contain affiliate links and I receive a small thank you if you make a purchase through a link. However, the purpose of this post is to save you the most money possible, whether you buy the card or not. Hope you find this post helpful! The Go Boston Card by Smart Destinations is an attraction card where you pay a flat fee and you can get into as many attractions as you want for the number of days you buy the pass for. This is great for travelers who like to see a lot of attractions in a short amount of time. How much is the Go Boston Card? There are also many Go Cards for other cities if you are looking to travel outside of Boston soon. If you are looking to see if the card is worth it, I would make a list of all the attractions you plan to see and then add up the prices you would pay for each one whether it be at full-price, with a AAA discount, museum free day, military discount, etc. Then compare the price you would pay with and without the attraction card. Below is the list of all attractions included in the Go Boston Card with the current attraction price (as of May, 2017) and the best discount offer in my opinion. Please note that there are SO MANY DISCOUNTS to Boston Attractions that I only listed 1-2 discounts to the Boston attractions only, but you can check out the BIG List of Discounts to Boston Attractions to see if you qualify for any other discounts, like military or teacher discounts, for example or to find discounts for the attractions located outside the city. Please note that this info is human compiled (by me) and I can make errors. Please make sure to verify the info below as prices and info can change. If you notice any errors, feel free to leave a comment below. Thanks. Tip: Suggested donation on Wednesday nights after 4pm and free the first weekend of every month for Bank of America and Merrill Lynch Cardholders. Youth 18 and under are also free when school isn’t in session. Tip: Massachusetts Residents can receive free admission (with advanced reservation) for up to 4 people September-June with Boston Public Library Card and area libraries have discount tickets for $10 a person + many other ways to save. Tip: Go on your birthday for free admission (closed on Tuesdays though), but there’s a lot of different discounts to this art museum to save a few $, including wearing Red Sox gear. Tip: Mass residents save $2 on admission with ID and Bank of America and Merrill Lunch cardholders can receive free admission the first weekend of every month with Museums on Us. Tip: Head to your local library for discount passes. Sam Adams Brewery Tour: This is free and open to the public with a suggested donation of $2 for everyone. Note: This is a seasonal attraction from May to October. However, you can easily take a free self-guided walking tour anytime (although you may not get into some attractions in the evening). Tip: Forget the cruise around the Harbor, and get on board the USS Constitution for free (with suggested donation) as a freedom trail stop. Just remember to bring your ID as you will be going through a military checkpoint. Tip: There is another Harvard Walk tour available to the public which is directly through Harvard at no cost. Tip: Free for Harvard ID holders, military members from Memorial Day to Labor Day and free for Mass Residents on certain days and more. Note: This is the only whale watch company directly out of Boston. However, there are a lot from other coastal towns. Groupon usually has the best whale watching discounts (IMO) if you are looking for alternatives. Tip: Ticket prices vary greatly depending on game and seats. Check out Red Sox Games 101 for more information about Red Sox tickets and ways to stay on budget for games! The Go Boston Card also has the option to build your own card. This is where you can hand pick your destinations and only pay for what you will see. This is a great option if you only want to see a few things and you don’t qualify for many discounts mentioned on the Boston Discount Attractions page. You can save up to 20% on Boston attractions with the Build Your Own Go Boston Card compared to 55% with the regular pass; however, if you won’t take advantage of all the attractions on the regular card, you may end up saving less than 20% in the long run. It’s really up to you to decide what pass may be worth it, if any. There is also another discount attraction card for Boston, Boston CityPASS, and I did a breakdown of the Boston CityPASS to see if the pass is worth it or not. It’s a lot smaller of a pass and only includes a few major attractions compared to this card. Everyone travels and sightsees differently, so it is really hard to say if Smart Destination’s Go Card is worth it or not. You really need to make a list and break it down to figure out if it makes sense for you. I hope you found this post helpful– Let me know what you decide in the comments below and let me know if you have any specific questions! Hope you have a great trip to Boston! For more information or to purchase a go card, please head here. It’s definitely good for people that like to do everything! Very impressed that you are able to get downtown for less than $100! Awesome 🙂 Hope you had a great visit!